← When Israeli bombs kill kids, who is guilty – Israel or Hamas? Would you give up your soul to Satan for time on this earth? 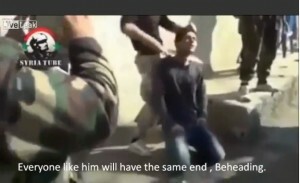 Islamist Jihadis force this Christian to recite the Moslem Creed and then behead him. Jihadis in Iraq of the ISIL army are murdering non-Moslems as they conquer town after town, and Obama sits back in the White House content to do nothing. Iraq will fall to his Sunni brothers as they move to conquer what America liberated. They will re-establish Sharia, the law of Mohammad, and destroy everything America spent years of war and billions of dollars to make a better Moslem nation. Islam is a religion of evil, their god Allah is Satan, and their goal is to destroy Christianity. To deny Christ is deny yourself salvation. We are all going to die. Is it worth having any more time on this earth, be it seconds or years, when our souls are in jeopardy? If you don’t believe you have a soul, then you lose nothing, just as these men who act as murderous animals with no soul. If you know you have a soul then you know this life is temporary and will not miss it when it’s over. Jesus doesn’t promise peace and prosperity, nor even a sinless life. His promise is to be there for you when you fall and take away your sins before God the Father. Accept Jesus into your heart and know God’s Love, and then tell others who don’t know that the only redemption is in Christ. Life is short and they need to hear His Word and learn to recognize the difference between the Left who live without God and the righteous who have Jesus in their hearts.